Last time we did some (very rough) preliminary tests comparing an early version of the hex pickup with a Fender Stratocaster and a Gibson Les Paul. The initial test was done using a 2000 turns AWG 42 coil and the cheapo TL072 Op Amp in differential configuration. The goal basically was to see the frequency spectrum of lower impedance coils side by side with that of the single-coil Strat and Les Paul humbucker pickups. Here we will continue with the tests, this time focusing only on the Hex pickup installed on a Strat while continually improving on various aspects of the pickup design. Note: This is the initial test and is continually being updated. 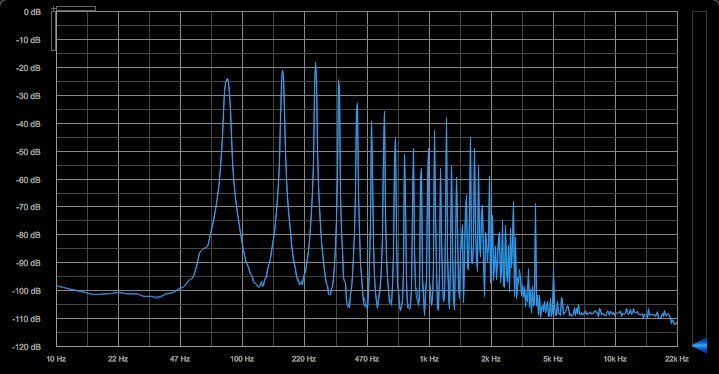 See Let it breathe (part 3): Frequency Response for a latter installment. What has changed from the previous test? Better electronics. We use lower noise Op Amps and better circuit design. Right now, we are using the low power LME49726. This Op Amp is quite capable and consumes very little current (0.7 mA). Soon, we will be trying out even better Op Amps. Lower impedance. This time, we tried coils with 1000 and 500 turns (150 and 75 ohms D.C. resistance). The gain is increased from 5 to 10 to compensate for the lower output of the 1000 and 500 turns coils. Better coil design. The bobbin is a bit taller at 8mm (before it was 5mm). The neodymium magnet remains the same at 5mm height thus making the bobbin and coil a bit taller than the magnet which is placed halfway from the top. With this setup, the magnet has lesser string pull. With less string pull, the coil can be positioned closer to the strings giving it better focus (not to mention less cross-talk). A better focused coil gives the pickup a tighter response and fuller mid and bass without sacrificing the upper harmonics. Picking near the bridge, slaps, etc., bring out all the harmonics. The overall balance is noticeably better. In this experiment, it turns out that the frequency graphs of the 500 and 1000 turns coils are more or less identical. It seems that going further low does not bring any more sonic improvement. It is very plausible that even with 2000 turns, we’ve already reached the optimum wide-band frequency response with a cutoff point well beyond 20kHz. Next time, we’ll test 2000 turns again and probably go as high as we can —as high as the bobbin can accomodate (around 3000 turns). We’ll also get into actual frequency response measurements of the coils. Our goal would be to find the maximum number of coil windings with a cutoff frequency not lower than 20kHz. We want to max out the number of turns to optimize the output. By doing so we can lower the preamp’s gain which will then give us the best dynamic range and signal to noise ratio. It’s always a balance. Next post Singles or Doubles? I just found your blog while looking at neckthrough style of construction (I have a 74 RIC 4001 and love it). I have been learning lots about audio this past while. My training years ago was broadcast electronics, but there have been many changes since the 70s and I have been working in a non-audio field for 20 some years. So I have had a lot of catch up to do. One of the surprising things I have found in my limited recording experience, is that 20 to 20k audio is not all it's cracked up to be. I have a quite new condenser mic (AT 2020) that sounds way better than even the much more expensive dynamics I have. Much of that is the much more open high end. So from that view wider freq response is a great idea. Then I listened to some things recorded with a ribbon mic which I would say maxes out around 16 to 18k. Certainly less than any condenser mic. But my first response was that I was in the room with what was being recorded. I don't know how this relates to guitar pickups where the player is looking for a synthetic sound and will likely modify or distort it any way. I would also point out that the guitar amp is a very integral part of the instrument sound. It seems almost odd that the chosen guitar amp speaker is 12 inch while many bass players prefer 10 inch speakers. The high end roll off in the speaker of a guitar amp must be pretty low. Perhaps you have a new amp in mind too 🙂 Though, to be honest, that roll off is probably used to roll off the much of the sound caused by distortion. A cleaner sound works pretty good through a full ranger system. Your posts have been a great read. I have learned a lot from all of it and opened new areas of thought too. I have a Hohner "The Jack" guitar which I enjoy, but have found tunning to be more sensitive to temperature than any of the wooden guitars I have/have had. I need to handle the guitar for some time before tuning. Playing cold doesn't work. The headless part has it's drawbacks too. Aside from finding strings, I find that playing open chords the neck could still be a bit longer… maybe just 1/2 inch.